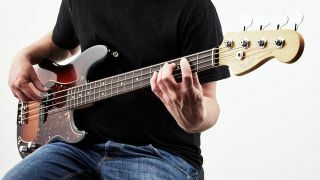 BASS WEEK: Playing lines based on root notes should be every player's starting point when learning bass. Root notes provide a solid, steady foundation for a band to play over. However, to develop a deeper understanding of the fretboard you’ll need to know a bit about chord structure. Here, we’ve provided three versions of a D-A-Bm-C chord progression, with three ideas that you can use to create different sounds and moods. A basic understanding of the root, 3rd and 5th intervals of each chord is all that’s needed to really understand what's going on. That said, even if you're not familiar with the theory you can still play the examples below. As you gain confidence with the 'root, 3rd and 5th' harmony of the first two examples, you can try the 'approach notes' method of our final line. The idea here is that you use alternative notes in between those vital root notes. Major and minor chords have three notes. The gaps between the notes are known as intervals and are numbered I, III and V because they are the first, third and fifth notes of a chord's parent scale. This table should make things clearer. This basic arpeggio idea uses the root, 3rd then 5th of each chord. Be careful when moving to Bm - minor chords have b3rds so the gaps between notes change here. Try using slides or hammer-ons from the note below the 3rd. Here each chord is underpinned on bass by 5th and 3rd intervals, but no roots. Other instruments are playing root notes, so these chord tones fit right in and there is a brighter vibe than you’d get from a pure root note approach. This idea uses chromaticism, ie, one-fret intervals using ‘out of key’ notes. The ear has a great way of forgiving the ‘outside’ notes, because you’re always targeting a new root note as you change to the next chord. Keep in the mind the ‘root, 3rd, 5th’ concept to keep your ear attuned to the sound of the chord.